STEP 1: Select the file appropriate for the software that you own. STEP 2: Choose to save the file to your computer. Never choose "Open with". This creates a temporary file and will cause errors when trying to save the project. By default, most browsers will save downloaded files to the Downloads folder on your computer (Mac and Windows). 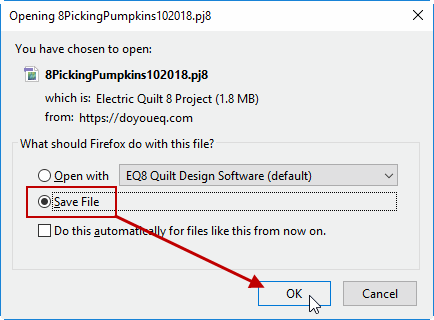 You can keep the downloaded project file in your Downloads folder, or follow the instructions below to move the file to your My EQ folder. Double-click the file to open it in your EQ software. 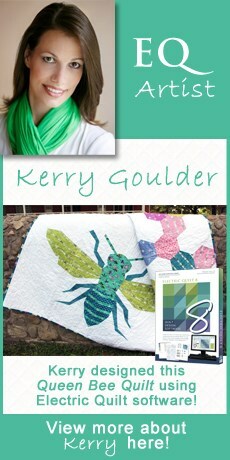 View the Sketchbook to see the quilts, blocks and fabrics. As mentioned above, most downloaded files will be saved in your computer’s Downloads folder. You might want to keep all your projects in your My EQ folder. Navigate to your Downloads folder and locate the file. Right-click and choose Copy. Or, press CTRL+C (or Command+C for Mac users) on your keyboard. Navigate to your My EQ folder (My EQ8, My EQ7, or My EQ Mini). In the Projects folder (or PJ7 folder for EQ7 owners), right-click and choose Paste. Or, press CTRL+V (Command+V for Mac users) on your keyboard. The file will be added to that folder. Double-click on the file to open it, or open your EQ software and choose FILE > Open.